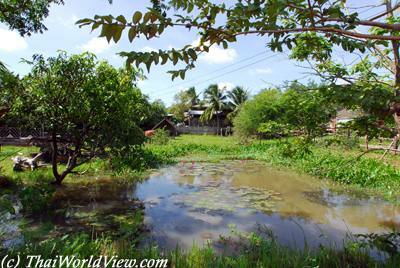 All Isan villages have common characteristics that are described below. 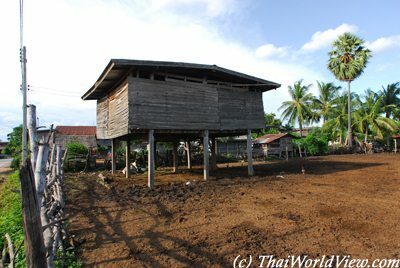 Many Isan houses are made of old and strong wood. Modern houses are made of brick. 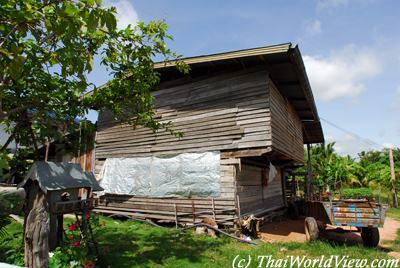 When travelling through Isan, visitors can see many houses with non hidden bricks. The owners couldn't finish the external aspect of the house. 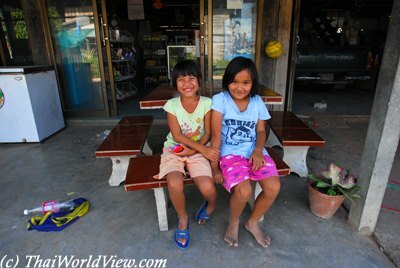 "ISAN" is Thailand's poorest area. In some remote villages, houses don't have running water. There are some big jars to keep water that fall from the roof. There is a pipe that goes from the roof to the jar. During the monsoon the jars are filled gradually. With two big jars it is enough for washing during a whole year. 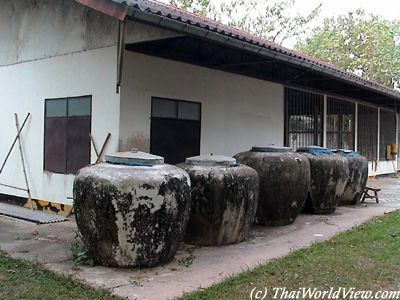 The large cement jars have become common in the mid-1990s and can be seen all over Isan area. Before small clay jars or ceramic jars were used. In the past, during the dry season, villagers went in a caravan with many carts to large rivers and stayed a few weeks to collect enough food. Fish were dried and preserved with salt and rice bran. This kind of fish is called "PLA RA" (ปลาร้า). 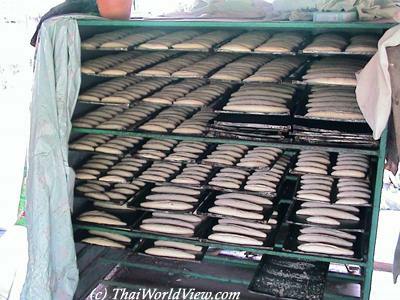 They would also prepare "PLA SOM" (ปลาส้ม) with salt and rice to make salty and sour fish. It could be kept and eaten over a long period of time. Nowadays such food is still a favorite for local Isan habitants. 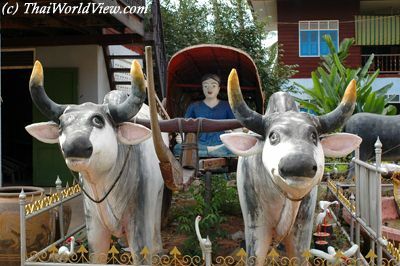 The famous ox carts (เกวียน) have died out. 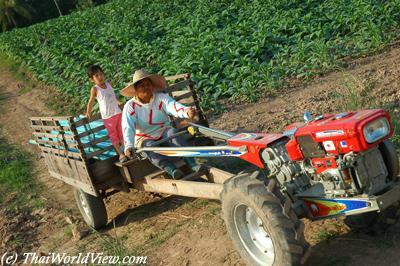 They have been replaced by motorized tractors used for ploughing. 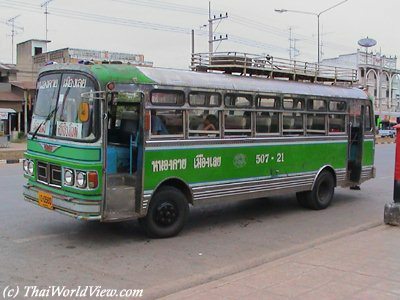 Buses speed through Isan villages. There are footbridges to cross the roads because cars, autobus really drive fast and it can be dangerous for children. Sometimes Police stop buses to check the ID papers. They are looking for illegal immigrants from Laos or checking the autobus driver hours of driving. In Isan area there are more motorcycles than cars. Often three people ride motorcycles, i.e. the parents and their child. Five people (two adults and three children) is also not a rare combination! They don't wear a helmet due the heat. 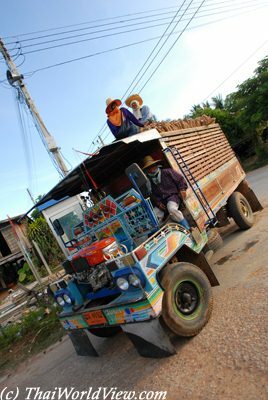 Such farm multi purpose truck (รถอีแต๋น) is very useful to carry farmers in order to go working in the paddy fields. They are also used to carry the rice after the harvest. The Buffalo boys (เด็กเลี้ยงควาย) still exist in Isan area. As buffaloes like to roam the fields, those children are responsible to keep watching them. Those children are often coming from very poor families and don't go to school. The engine is the same as a ploughing machine. Such Farm multi purpose truck cannot go fast but can carry heavy loads. In a pickup car, more people can seat. Two in the front seats, four in the back seats, and many people in the pickup back area. That is the typical configuration before going for lunch near a waterfall. Many people coming means it will be very funny (สนุก - "SANUK"). Nowadays, when a farmer goes to his fields, he often rides on a ploughing machine. The ploughing machine has replaced the buffalo and cart. It acts as a tractor and pulls a trailer. The iron-spiked wheels then need to be exchanged for tyres. 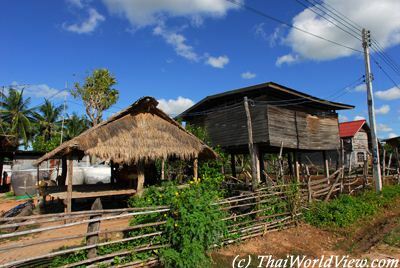 It is very common to see many old people and young children in Isan villages. Young people go to Bangkok to find work and come back home for festive period such as New Year or "SONGKRAN". 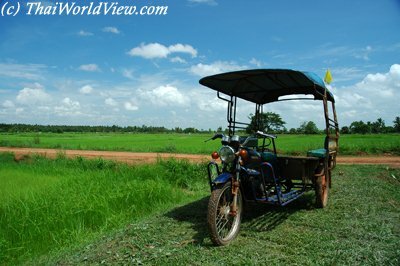 Such local "TUK TUK" (ตุ๊กตุ๊ก) is used to carry workers directly to paddy fields. 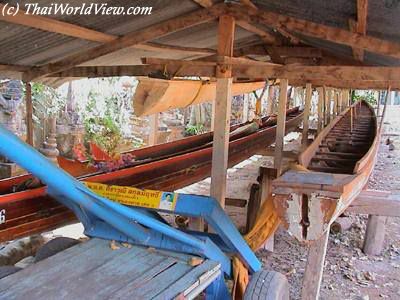 In many Isan temples close to Mekong river, long boats can be found lying under sheds. They are used for races at the end of rain retreat. A village was always settled on the edge of a river or in a place where water resource could be available within a day. 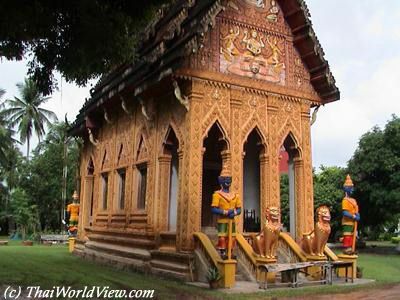 In Isan villages Buddhist temples have often toned down colors. Temples are less glittering than in Bangkok. Often they are just covered with painted colors. No stuff that glitters in the sun. Due to hot temperatures (up to 40 °C / 104 °F) and heavy rains during the monsoon, the temples colors lose gradually their brightness. 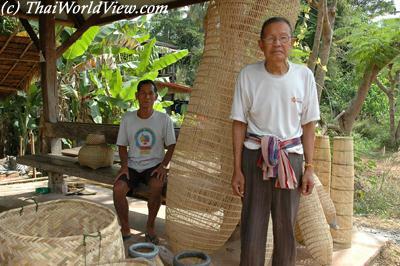 Some skillfull men make baskets ("KRATIT KHAO" - กระติกข้าว) to keep hot the sticky rice ("KHAO NIO" - ข้าวเหนียว ) and also specific nets to catch fishes in rice fields. 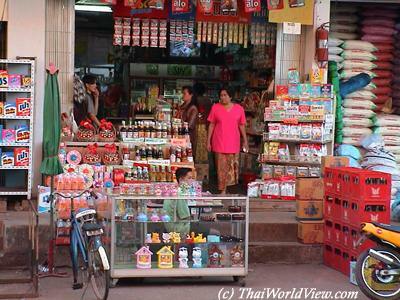 Previously in Isan villages, stores were often managed by Chinese or Vietnamese people. 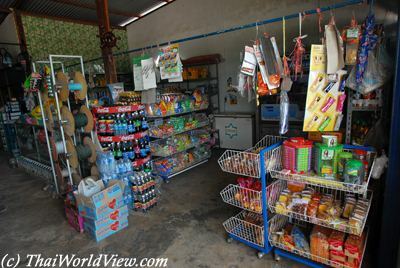 When Vietnamese people leave a village, they never sell their store. They leave it there for the next Vietnamese people. They were often blamed to send the money to Vietnam, not like Chinese peole who stay here during their whole life. The "NAI HOI" were historical local cattle merchants leading buffalos from Isan to the central regions of Thailand to sell them. The major difference between the "NAI HOI" (นายฮ้อย) and Chinese traders was that villagers knew that the "NAI HOI" were local people. So while trading, they understand locals and their culture. 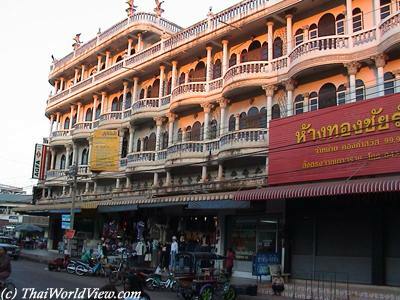 In provincial cities, such buildings are very common with shops on the ground floor and the housing on upper floors. In villages, neighbours help each other. The water company employee is coming every month to get water bills. If some neighbours are absent, one will pay for the others and then get reimbursed later. During the dry season in many villages visitors can also see older women looking after babies and children, while fathers and the youth are working in Bangkok or other big cities. Significant groups of Chinese and Vietnamese migrants settle in Isan. In Nongkhai province, Vietnamese sandwiches can be purchased. 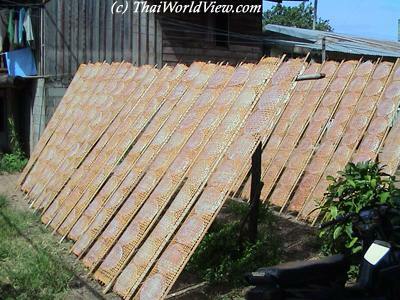 After rolling the papers on the bamboo panels, there are set in the sun to dry. Sri Chiang Mai is famous worldwide for this activity. Isan man have always use tatooes. It is part of their life. Isan girls have always liked young men with tatoos. Tattoing the body was common among young village men as it was a sign of manhood. 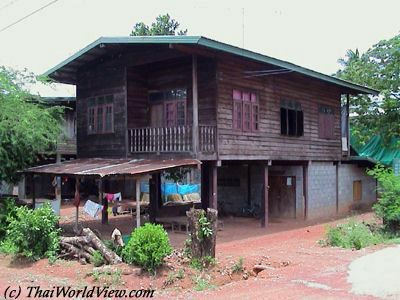 In Thailand, houses have been built with strong wood because termites, ants and other insects quickly destroy the soft wood. Electricity came to most districts in the late 1960s. Electricity in villages allows the purchase of electrical products so creating new needs for villagers and starting the endless debt cycle. Houses were usually 5 to 6 meters high. The ground level is left for cattle, buffaloes, chicken and ducks. The family live in the upstairs part. Such house has no toilets and no bathroom. Around the house, families grow fuits trees such as mango, papaya, banana trees and have a small garden to grow vegetables. Up until the late 1970s hospitals were only found in provincial towns or sometimes in larger district towns. In most district towns, the government establishes community Health Centre ("SUAN SUKHAPHAP" - สวนสขภาพ). 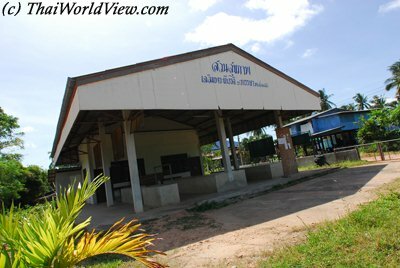 Each village has a community Health Centre ("SUAN SUKHAPHAP" - สวนสขภาพ). 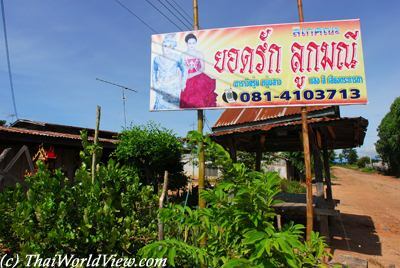 There are still some "MO YA SAMUNPHRAI" (หมอยาสมุนไพร) or medicine herbs doctors. They are well known healers who use herbal medicines. 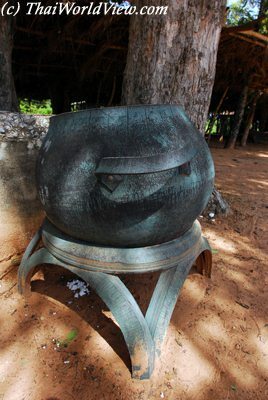 The "MO YA PHI FA" (หมอยาผีฟ้า) is invited to cure a sick person in cases when the cause is not known. 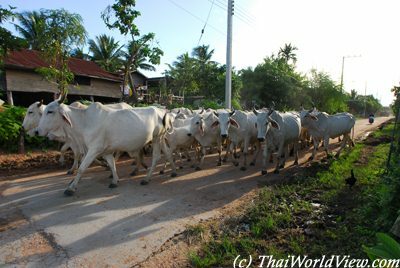 Local Thai farmers are bringing back their cows before sunset time. The "MOLAM" (หมอลำ) are those who are known for their skills of singing, dancing and entertaining in "LAM" (ลำ) style. Nowadays "MOLAM" music is famous all over Thailand. Local bins are made old recycled tyres. In fact tyres are broken down and the material re-used in lower grade applications. 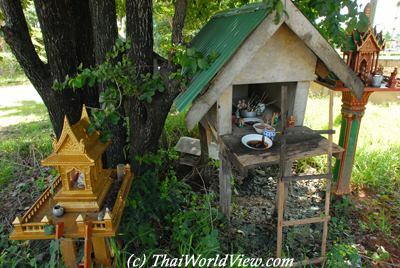 Villagers always construct a spirit shrine or "SAN PU TA" (ศาลปู่ตา) at the fringe of the village. The place has to be peaceful with big trees offering shade. Recently arrived migrants shall always ask for the protection and blessings of "SAN PU TA". At the Shrine of the village ancestors, local people make an offering to the spirits of their ancestors. Every year everybody must pay respect to the ancestors and all the grandmothers and grandfathers who have died. If people did not do that, they could not expect to have a good life. Most villagers still seek the advice of elders. They know that without their blessing it would be difficult to get villager's participation in community activities. Having many children was a sign of fertility and the large family was blessed. After the birth, the woman has to lie by a fire. This fire helped to purify of all poisons and influences from ghosts. In the past, girls should stay at home as being literate was unnecessary for females. "MOLAM" (หมอลำ) concerts are very popular in Isan area. 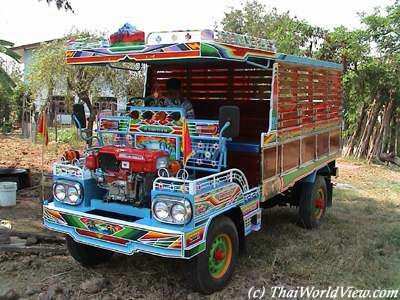 In the past medicine trucks ("ROT KAI YA" - รถขายยา) were travelling through Isan. During the dry season, these mobile cinemas come to village to show films and sell medicine. Today the Isan language continues to be language learnt and spoken at home. Villagers used to assist each other during stages of rice growing. Help was needed during transplanting, harvesting and threshing. Nowadays farmers rely on their family and hired labour. 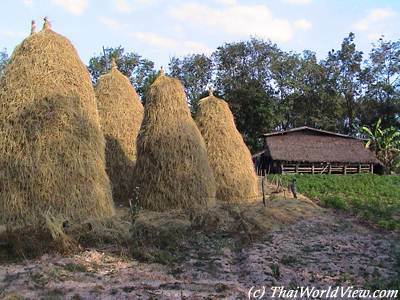 A Thai haystack (กองฟาง) is composed of rice straw. It can look like a carefully sculpted Stupa. The size of haystack often indicates the wealth of a farm owner.